Conjuring is in Phyllis Wong's veins. It was passed down from her great-grandfather who, before his mysterious disappearance, was one of the world's most brilliant and successful magicians. 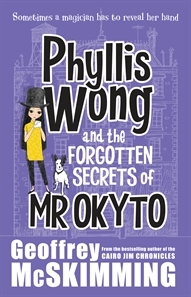 Now Phyllis lives in what was his grand old home, converted into a number of apartments, in the middle of the city with her father and her loyal dog Daisy.When a series of incomprehensible robberies takes place in the city, Phyllis realises there is much more to the crimes than meets the eye. It may be baffling her friend Chief Inspector Inglis, but Phyllis is determined to find out more. Who is this thief? What does he want? And how is he achieving the impossible? I have never read anything from the Cairo Jim series, so I didn't really know what to expect with this book. I love a mystery, and I love a little bit of illusion too, this book is a combination of both of those things, so I was hoping for the best. I love characters like Phyllis Wong. She is smart, talented, quirky and individual, exactly the kind of person I either wish I was as a child, or wish I knew. Magic and illusion is in Phyllis's blood. Her great grandfather Wallace Wong (Conjurer of Wonder) was one of the most highly paid magicians in the world, until his mysterious disappearance in 1936. Phyllis lives in the Wallace Wong Building, built in 1932, a beautiful example of Art Deco architecture, it's three storeys tall and Phyllis lives here on the top floor with her father and an assortment if interesting neighbours. The lobby is flanked by The Delicieux Cafe on one side and Lowerblast's Antiques & Collectibles Emporium the other. Both of these locations and the people that work there play significant roles in the story a it unfolds. Mrs Lowerblast's Emporium is the location for the first mystery, because Mrs Lowerblast has been robbed. It's not your normal robbery though, as no one actually broke in. One of a pair of very valuable book ends was switched right before her eyes. The suspect is a man who wears a frock coat, a monocle and has a scar running across his face. When another 'impossible' robbery takes place, and a man fitting the description of her other suspect, Phyllis starts to suspect that old fashion magic is behind both crimes. Now she just has to figure out who the mystery man is who's behind it, and how they managed it! Like I said, I loved Phyllis, and the other characters are equally as endearing. Like the xylophone playing/gadget loving Clem and the dashing tennis playing Chief Inspector Barry Inglis. The language is rich and the story is clever and fun, and there's the bonus of finding out a few magicians secrets along the way!